Arianna Huffington was barely off the Sunday News show circuit when the tweets went out. George Stephanopoulos’s read “Arianna on Summers: ‘Wrong man for the job’”. “I’ve always thought that under-populated countries in Africa are vastly under-polluted” (Summers on exporting waste to the developing world). He is sluggish, pedantic and uninspiring – at best. At worst he may very well be the confidence vortex from which hope itself is unlikely to escape. Unless he has some extraordinary skills, some special (unknown) value to the President, unless he’s got some magic filter of economic explanation & debate; I fail to see the allure. All Presidents struggle with the balance between message, confidence and candor (even without the pressures of recession). His team must finesse that effort, lighten the load – not add to it. 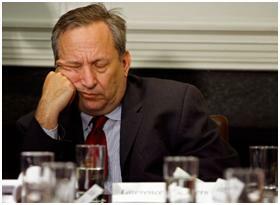 Lawrence Summers is a liability to the President (and to an already weak communication team) and a disappointment to recovery and to the greater ‘market confidence’ we all so desperately need. Who’s next on the list?